"No Frills" Hermes Beard Oil. Hermes is the path to the mystery at the heart of life. Understanding this, the creative man seeks knowledge and insight to improve his fortunes and to stay his path, which is no doubt unconventional and subtle. 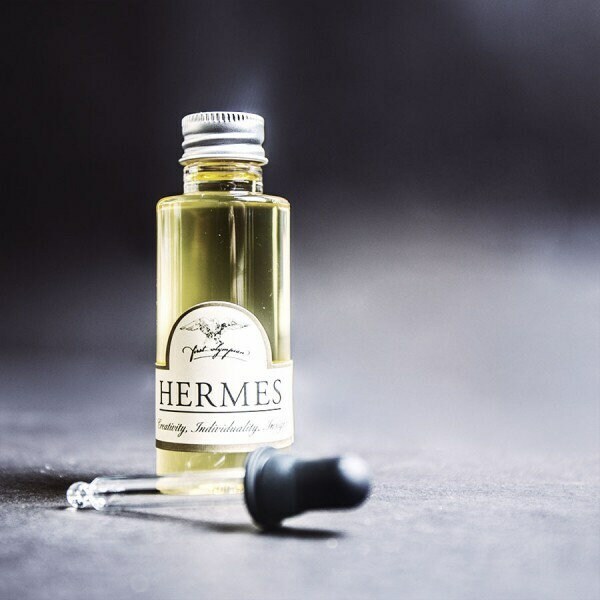 Hermes beard oil is a magical blend of rare and exotic ingredients, sandalwood from the Far East, vetyver - or Indian Khus - alongside the freshness of watermelon and other intoxicating notes. The overall effect is sweet, lively and almost edible with intriguing subtleties that seem to shift with time, revealing ever-warmer and more comforting levels. Key Notes: Sweet, minty, soft with delicate hints of fruit and balmy autmunal breezes. Suits: times of industry and application, conversation, debate and camaraderie. Please note: all of our full bottles are supplied with a glass dropper/pipette for easy, mess free, ½ml application of your beard oil. Each full bottle contains 50ml, giving 3 months supply for all but the heaviest and most manly of beards. This listing is for the 'No Frills' version - a simple PET plastic bottle: safe, non-toxic, strong, lightweight, flexible and 100% recyclable. No box, superfluous packaging, no glass or cork. Travel-friendly.